The standard spinner has gained a world-wide reputation as a top fishing lure. Its simple design has remained basically unchanged for decades. Because standard spinners sink slowly, they are rnost effective at shallow or rnediurn depths. 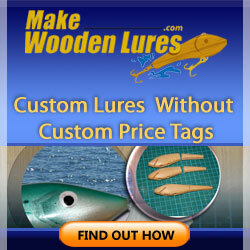 They work best in open water, but can also be fished in sparse weeds or over weed tops. They are not as weed-resistant as safety-pin spinners. Standard spinners come in two main styles. The most common has a blade attached to the shaft with a clevis. 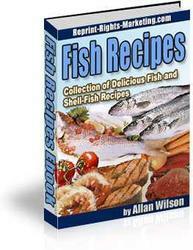 It produces a strong beat easily detectable by the fish and the fisherrnan. A sonic-type spinner has a blade that spins directly on the shaft. The blade is concave on one end and convex on the other. A sonic blade starts rotating at a low retrieve speed. It has less water resistance than a blade mounted on a clevis, making the lure well-suited to fishing in fast current. Sorne standard spinners have buoyant bodies rnade of balsa or low-density plastic. With weight attached to the line, these spinners will float above bottorn where they cannot snag on rocks and logs. STANDARD SPINNERS come in two basic styles. The (left) clevis type has a blade attached to a U-shaped metal clevis that rotates around the shaft. On the (right) sonic type, the shaft runs directly through the blade. The body of a standard spinner is behind the blade and consists of an elongated piece of metal, or of metal or plastic beads. In addition to the body, most spinners also have a separate bead behind the blade to reduce friction. (32) [email protected] Spinner, (33) [email protected], (34) MeppsterTM, (35) Spotted Marauder, (36) Sonic Rooster Tail@, (37) Musky Fin, (38) Black PantherTM, (39) Tiger TailTM, (40) Panther Martin Fly. In a survey conducted by a national muskie fishing club, large bucktail spinners accounted for more trophy muskies than any other lure. Big spinners work equally well for northern pike, and smaller versions excel for pickerel, trout, salmon and small-mouth bass. When selecting spinners, the main consideration is overall length (from end of shaft to end of hook, including dressing). 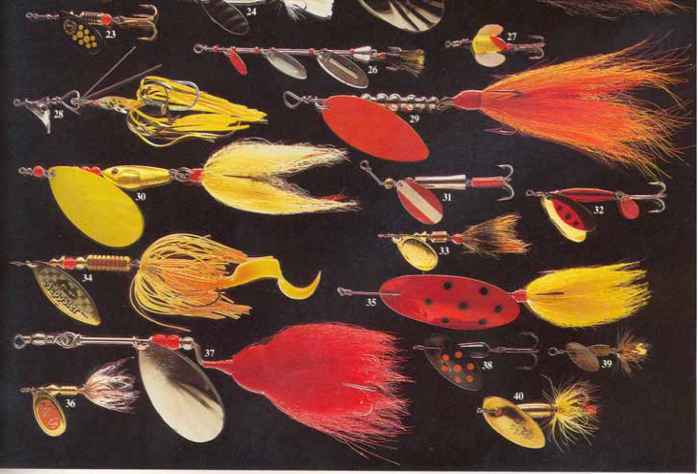 For small- to medium-sized trout, spinners should measure l l /2 to 3 inches; for smallmouth and spotted bass, pickerel, salmon and large trout, 21/2 to 4 inches; and for northern pike and muskies, 4 inches or longer. The blade does not rotate as the lure sinks, so standard spinners generally work better when retrieved steadily than when jigged erratically. In some cases, yon Tay have to twitch the lure to start the blade spinning. If you reel a spinner at constant speed, fish will often follow without striking. But if you suddenly reel faster, they may grab the lure, thinking it is attempting to escape. Increasing the speed also makes the blade rotate faster, changing the pattem of vibrations and triggering uninterested fish. When fishing a standard spinner in deep current, you may have to angle your casts upstream to reach the desired depth. If you cast downstream, the blade will spin too fast, giving the lure too much lift. In shallow current, angle your casts downstream to prevent snagging. Like a thin spoon (page l20), a standard spinner works well when drifted into hard-to-reach spots and allowed to hang in the current. A major problem in fishing with standard spinners is keeping the blade turning freely. If the clevis becomes bent, it may bind on the shaft, slowing the rotation of the blade. Because standard spinners lack a safety-pin arm or tapered body in front, weeds and bits of algae teml to foul the blade. Another problem is line twist. The shaft tends to revolve in the direction the blade spins. To minimize twisting, attach the spinner with a ball-bearing swivel. A clevis that is bent or fouled with weeds also causes line twist because water pressure against the fixed blade makes the entire lure spin. You can also prevent line twist by selecting a spinner with a bent shaft or bending the shaft ahead of the blade so it forms an angle of about 45 degrees. A bent shaft makes a swivel unnecessary. How to attach spinner to line? What is a spinning drift bobber? How to use metal clevis with blade? How to attach a spinner on a lure? How to fish a spinner in fast current for trout? How does a sonic spinning lure work? How to make pike spinner?